The busiest online poker rooms on the Horizon Poker Network are giving free blackjack hands this weekend. Intertops Poker and Juicy Stakes offer a selection of casino games including four types of Blackjack. Until Tuesday you can get one free hand for every four hands of Blackjack you play. The free hand value will be the average of the four bets. The suite of casino games in the poker rooms' software features four Blackjack variations: Blackjack, Face Up 21, Double Draw, Perfect Pair. (Blackjack games in Intertops’ main casino are not included in this offer.) There are also ten video poker games (Deuces Wild, Bonus Poker, Double Bonus Poker, Jacks or Better, Aces and Faces, Double Joker Poker, Tens or Better, Joker Poker Kings, All American Joker Poker Aces and The Saloon), two types of Roulette (American and European) as well as Caribbean Stud, Casino Hold’em and Let It Ride. 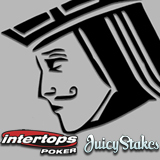 Details: Free Blackjack at Intertops Poker and Free Blackjack at Juicy Stakes. Play 4 hands, get 1 hand free until Tuesday, January 17, 2017 only. Intertops Poker satellite tournaments and Juicy Stakes Poker satellite tournaments often send online players to major live tournaments in exotic locations in Europe and the Caribbean. This month online poker players can win their way to the prestigious Winter Poker Championship in Seefeld, Austria.